Access: On the Menu bar, click View > Map View. Menu bar entry: Displayed on the Menu bar. Toolbar: The standard toolbar and some extra buttons related to the Map View. 2D View: Displayed in the main window. By default the Satellite view is displayed. Status bar: Displayed at the bottom right of the Map View. Displays the coordinates when passing the mouse over the 2D View. Important: The 2D Map displays the Earth if the images are geotagged. Processing Area: Indicates the area of the project for which the different outputs will be generated. Standard toolbar buttons: For more information: Interface. Zoom In: Zooms in the selected view. Zoom Out: Zooms out the selected view. Satellite (default): Displays a satellite view of the project's location. If none of the images is geolocated and there are no GCPs in the project, the whole Earth is displayed. Maps: Displays a map view of the project's location. If none of the images is geolocated and there are no GCPs in the project, the whole Earth is displayed. The background map is provided by Mapbox. Section which displays the location of the project on Earth and the project elements (images, GCPs, etc.). For more information: Menu View > Map View > 2D View. Latitude and longitude coordinates are displayed. The X and Y coordinates of the selected output coordinate system (Select Image / GCP / Output Coordinate System ) are displayed . 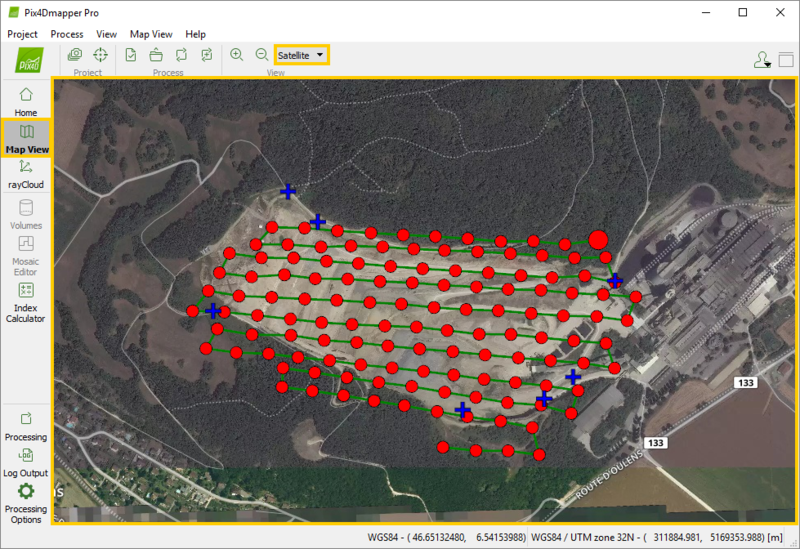 Note: If the project has no georeference or it is georeferenced in an arbitrary coordinate system, only the geographical WGS84 coordinates are displayed.